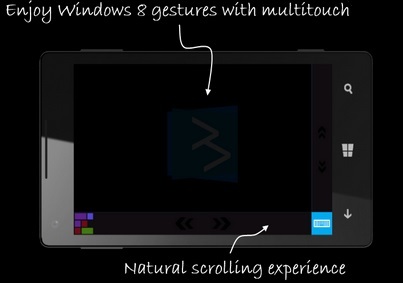 This software turns an android phone into a multitouch controller for windows 8. It's however not free except the very basic features - those being enough to take control of the mouse and access the Start Screen and the Desktop. Win8 Controller comes with a client part to be installed on the Android, and a server part to be installed on the remote Windows 8 PC. Using this software you control the remote PC as if it is a tablet. I can't switch to the Start Screen touching the Android screen with four (or five) fingers. I loose control of the mouse as soon as the "Task Manager" is open on the remote PC and has the focus. I re-gain the control if I run another application which fakes the focus. However, I can't close the "Task Manager" clicking its close button. Win8 Controller doesn't run as a service and I can't use it as long as I am not logged on the remote PC with a user. This is mainly a blocking issue on my HTPC where I have replaced the Windows Shell with Media Center. Indeed, only services can run in the background if the Shell is not run. While you manually trigger a FlexRAID job using the client FlexRAIDcmd.exe or when a FlexRAID Scheduled Job is started, its status is not displayed automatically in the Web UI currently opened. The job should also now appear in the "Command Execution Center" (FlexRAID UI > Your Configuration > Tool Box). In that "Command Execution Center", the "Pause", "Resume" and "Abort" buttons should now be accessible. WCF Services - The request failed with HTTP status 405: Method Not Allowed. The FlexRaidClient for windows, named FlexRaidCmd.exe, is not installed by default with the service. It must be downloaded as an Option here. class1_0 must be used for the new driver (=> class1) and to access the first pool (=> ID = 0). Starting the pool takes about ~50 seconds. Stopping the pool takes less than 10 seconds. Notice: if the Web UI was open before executing a Start/Stop, it must be reopened (or refreshed: CTRL-F5) otherwise it does not display the new state of the pool. Pay attention to the path separator! It's not the one used by Windows but the one used in Java! To shutdown the FlexRaid server after stopping the pool, use the command shutdown-server. => Pour pouvoir arrêter le service "host", le service de pool de stockage doit être arrêté! b) execute "Set-ExecutionPolicy RemoteSigned" in that shell and answer "Y"
a) Create a file "StopFlexRaid.ps1" in your "FlexRaid Client" folder (e.g.). a) On the Start Screen, type "gpedit.msc" and run it. b) Go to the node "Computer Configuration\Windows Settings\Scripts (Startup/Shutdown)". - Shutdown scripts are run as Local System, and they have the full rights that are associated with being able to run as Local System. - Shutdown scripts are run synchronously. The Server should wait on the script before shutting down. $flexCmd = "C:\Program Files (x86)\FlexRAID 2.0 Client\FlexRAIDCMD.exe"
$pinfo.Arguments = "$hostname $port $timeout $cmd"
throw "Command failed to execute"
#Write-Host "No Process started since Server startup"
Write-Eventlog -Logname 'Application' -source 'FlexRAID' -eventID 1 -EntryType Warning -Category 0 -message "Graceful FlexRAID Shutdown triggered"
write-host "Current powershell process is not running with Administrator privileges"
$message = "Graceful FlexRAID Shutdown not running with adhoc rights..."
$message = "FlexRAID process(es) still running and preventing Server to shutdown..."
"Wait on the Storage Pool to stop. This can take a few seconds." "Storage Pool failed to stop"
Write-Eventlog -Logname 'Application' -source 'FlexRAID' -eventID 1 -EntryType Warning -Category 0 -message "Storage Pool stopped before shutting down"
"Storage Pool actually not started"
Write-Host -NoNewLine "Waiting on $srvName to stop "
Here is the code to start FlexRaid, useful while testing. Write-Host -NoNewLine "Waiting on $srvName to start "
"Wait on the Storage Pool to start. This can take a while." "Storage Pool failed to start"